Looking for a bluetooth speaker with a little class? 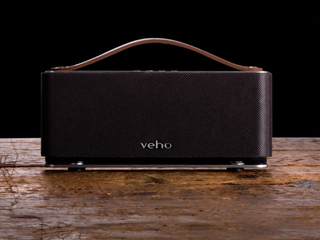 Not only does the Veho M6 feature spectacular sound, it comes in a distinctly retro style complete with brushed aluminum and a vintage leather strap. It usually runs for $180, but Jalopnik readers can grab one for $65 + free shipping w/ code VEHO15. The Veho M6 gets you everything you’d want in a bluetooth speaker: high-fidelity sound, 8 hours of playback time, optional line-in and a built in microphone. It’s the retro style that really sets it apart - the leather strap and brushed aluminum housing make this a must-have for any man-cave. It’s the perfect gift or personal speaker for anyone who values style just as much as function. Get yours at the link below or read on for more details. The Veho M6 usually runs for $180, but you can pick it up here for $65 with code VEHO15. Shipping is included to the US, and should take 1-2 weeks. Hit the link below for more details.